JP 2006-12-02 600 points ? US 2007-01-08 600 points ? EU 2006-12-08 600 points ? EU 2017-03-16 £5.39 €5.99 ? 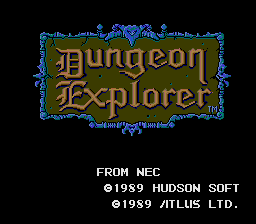 Dungeon Explorer (ダンジョンエクスプローラー) is an RPG for the PC Engine and TurboGrafx-16. Main article: Dungeon Explorer/Magazine articles. Sega Retro has more information related to Dungeon Explorer. This page was last modified on 30 March 2019, at 13:49.